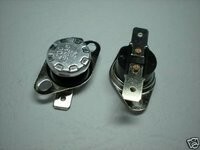 This is the replacement for the outside upper condenser fins fan switch. This switch is a normally open switch that is closed by surface temperture close to 130 degrees plus or minus a few degrees, depending on location and surface temps. This switch will activate the cooling unit fan or fans. The temp setting for activating the fans with this switch is a little lower than the OEM's fan switch. We feel it is better to have, when needed, the fan air flow starting before the cooling unit preformance starts to fail. This switch is use to replace the OEM's installed switch when they have a failure or to be added to refrigerator coils when adding your own fans. None operating fans, either from bad switch or bad fans, are the most common problem an cause of early cooling unit failure. The location of the fan switch is not critical as long as the surface temperatures are reached to have fan activatied before the cooling unit coils over heat and cooling unit failure occures. We have both fans and fan switches in stock.